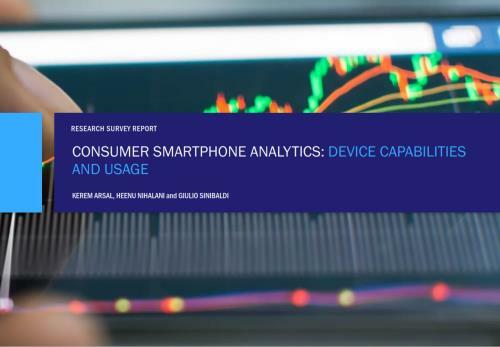 A deeper understanding of how users engage with their smartphones can help telecoms operators, vendors and software developers make more informed strategic and tactical decisions. We analyse data collected in real-time from more than 8000 smartphones in this report and provide insights on how engagement time, data traffic and video-viewing behaviour vary depending on the characteristics of the smartphones used (for example, age, network capability, camera quality and screen size). This report analyses real-world smartphone usage data to answer questions about the relationship between user behaviour and device characteristics, such as model age, network capability, camera quality and screen size. It assesses how engagement time, data traffic and video viewing vary by the characteristics of the smartphones used. The report also provides recommendations for operators concerning the role of smartphones as primary devices of engagement and monetisation. It is based on data collected by Verto Analytics using a passive on- device monitoring app during July and August 2016. What differences are there in users’ smartphone engagement (in terms of time and apps used), depending on how advanced the device is? Which apps and services are used on smartphones with different characteristics (for example, 3G or 4G, model age or camera quality)? How much data is generated by smartphones with different characteristics? How does video-viewing behaviour and data consumption vary depending on the screen size of the smartphone used? Strategy and planning executives who are responsible for mobile operators’ apps, services and communications strategies and partnerships with OTT players. Smartphone vendors and relevant operator units who want to learn about the impact of smartphone characteristics on consumer behaviour. Executives in mobile operators’ technology and innovations teams who are responsible for developing apps and services. Marketing executives at vendors of communication services equipment and software, as it will help them understand the needs of their operator customers and their end-users.